For other models using this name, see Bentley Continental Flying Spur. The car is manufactured at Bentley's factory in Crewe, England. Briefly, due to a lack of capacity at the Crewe factory upon the car's introduction, some Flying Spurs destined for markets other than the United States and United Kingdom were built at Volkswagen's Transparent Factory in Dresden, Germany. This arrangement ended in 2006, when all assembly work reverted to Crewe. A second generation known as the Flying Spur was released in 2013. During the first full-year sales of the Continental Flying Spur, the number of deliveries exceeded 4,500. The Continental Flying Spur has a 5,998 cubic centimetres (366.0 cu in) (6.0 litre) twin-turbocharged Volkswagen W12 engine shared with the Volkswagen Phaeton saloon, but tuned to produce 560 PS (412 kW; 552 bhp) and torque of 650 N⋅m (479 lbf⋅ft) at 1,600–6,100 rpm. Torsen-based permanent four-wheel drive is standard. It can go 0–100 km/h (0.0–62.1 mph) in 5.2 seconds, and can reach a top speed of 312 km/h (194 mph). The car has Four-wheel-drive with Adaptive Air Suspension and Continuous Damping Control. Sales began in Spring 2005. Beginning with 2011 Continental models, the W12 engines supports combinations of petrol and E85 bioethanol fuel types. The steering column-mounted paddle shifters enable direct access to the six-speed gearbox when the ZF transmission is in "S" or sports mode. The "Continental" prefix was omitted; according to Bentley's designers, this was a conscious attempt to take the Flying Spur in a more opulent direction and distance it from the more driver-oriented 2-door Continental GT range (historically, the Continental name has generally been used by Bentley to refer to models of a "sporting" nature). The Flying Spur and Continental GT continue to share the same engineering platform. However, the designs are quite different. ^ a b c d e f g h "Bentley Flying Spur Detailed Specifications". Bentley Motors Limited. Retrieved 10 March 2013. ^ "Bentley Flying Spur Detailed Specifications". Archived from the original on 26 March 2012. Retrieved 17 February 2012. ^ "Continental Flying Spur specification". BentleyMotors.com. Retrieved 2 September 2009. ^ "2014 Bentley Flying Spur makes its Swiss debut". Retrieved 27 October 2018. ^ Bentley introduces the all-new Flying Spur, Daily Telegraph, 20 February 2013, retrieved 10 March 2013, That GT icon was hard to shift in our minds. But eventually we realised we did have the potential to push the boundaries and were inspired to design a car in its own right, which is why the Continental name has been dropped. ^ "THE ALL-NEW BENTLEY FLYING SPUR". Retrieved 27 October 2018. ^ "BENTLEY ANNOUNCES LUXURY AND PERFORMANCE UPGRADES TO CONTINENTAL AND FLYING SPUR MODELS". Retrieved 27 October 2018. 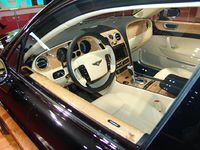 Wikimedia Commons has media related to Bentley Continental Flying Spur.